According to yesterday's Post Standard, the Department of Environmental Conservation has admitted to violating federal law by extending water pollution discharge permits without the required review. In many cases, the DEC allowed five-year permits to be extended more than 20 years without scrutiny. . . . The Ithaca Wastewater Treatment Facility, which discharges into Cayuga Lake, hasn't received a thorough technical review since 1987. Cayuga Lake provides drinking water for five municipalities in Tompkins County and is dotted with beaches and parks that extend into Cayuga County. We, of course, have our own dereliction of duty story with Oneida County spilling raw sewage into the Mohawk. (At least we don't have to drink Mohawk River water . . . yet.) Had DEC been on the ball, the violation could have been caught in the early stages. "We simply did not have enough staff to grind out extensive technical reviews every five years for all SPDES permits," DEC officials wrote in an agency document. During Gov. George Pataki's administration, nearly 800 scientists, engineers and enforcement agents were cut from the DEC. By the end of 2006, the agency had only 11.5 people reviewing more than 13,000 permits . . . Uh . . . Wasn't 1987 before Pataki came to office with his cuts? The Ithaca WWTF permit should have been reviewed again in 1992, before Pataki, but it was not. Since many permits were extended for more than 20 years without scrutiny, the problem certainly seems to predate Pataki and the cuts. DEC is a big agency with many, many programs. The 800 or so allegedly cut from staff were not all working on water programs and we are not told how many permit reviewers there were before the cuts. If the cuts were so bad, why did the public not hear about these problems with reviews before? Of course, government officials looking the other way on pollution laws allows for development to occur on the cheap ... The developers cultivate symbiotic relationships with the politicians who run things ... The politicians can point to Development as "progress" and a sign of their leadership abilities. Meanwhile, the developers, who are subsidized by our degraded environment, fatten their profit margins. I have no doubt that DEC's civil servants are doing the best they can, but they are supervised by political appointees. Look how our Oneida County Consent Order was handled: when the civil servants were pretty much on their own during the change in administrations, action seemed to be taken. After the new crew of appointees started settling in, a resolution was quickly reached . . . one that permitted "development" to occur . . . one that actually gave Oneida County (and New Hartford) credits for work that had already been performed . . . and one that rewarded the largest polluter with a parking lot as an "environmental benefit" project. The problem with DEC isn't staffing or funding. The problem is politics. . . . and it has been that way no matter which party has been in charge. An Ominous Headline . . . It's too bad when the needs of power plants take billing over the needs of people. The PEOPLE need cheap power . . . and the solution to that is more nukes closer to where the power will be consumed. Something Upstate Needs . . .
6  responsibilities and obligations of such authority. 14  be filled in the same manner as the original appointments. 17  incurred in the performance of their duties hereunder. 23  powers and duties hereunder. 3  justifying the existence of such authority. 8  than April 1, 2009. 25  ized to be made before such date. "The district will begin a marketing campaign as early as next week to promote the capital plan in hopes of garnering at least 60 percent support in the June 24 election." Marketing? . . . Promotion? . . . Public monies being spent to promote public spending? . . .
Also ILLEGAL . . . School boards are forbidden from spending public money to encourage voters how to vote in favor of the school budget or any proposition. Phillips vs Maurer, 67 NY 2d 672 (NYS Court of Appeals, 1986). When the "information" you are given is one-sided and heavily filtered so you are only told the positives and not the negatives, it is not mere giving "factual information." It is promotion . . . It is manipulation . . . It is an attempt to get you to approve a project. While it seems like everyone's complaining about it, few are doing anything about it ... "it" being another hike in Thruway tolls . . . on top of the one this past January . . . to be followed by another one next January and another one the January after. The place to fix this fiasco is in the State Legislature. . . and the "fix" is not to restrict tolls, but to do away with the Thruway Authority entirely! Let's make the Thruway toll-free like the interstate highways almost every place else . . . in New York and in the country. The only other upstate metro area with no free interstate is UTICA-ROME . . . The Thruway is a bigger drag on our local economy than most realize. It is no wonder that Buffalo and Utica-Rome have had the worst performing economies and the greatest rate of population loss in the state. It's time to get rid of this albatross. So where do Mr. Griffo and Ms. Destito stand on the abolishment proposal? Come to Utica . . . and Then Die . . .
Come to Utica . . . Have a Beer . . . and then die . . . At least that is what the "All About Beer" magazine will be saying in its list of the top 125 places to have a beer before you die. This is in the World, folks, so be proud of Utica! The F.X. Matt Brewing tasting room is the place to go. Whitestown Is On Line . . .
Whitestown assessments and other information about the Town, that is . . . are now available at Whitestown NY Online. . . joining New Hartford NY Online's offerings. It was nice to see the writeup on this in the Obserserver-Dispatch, too! Cathy Lawrence and the Concerned Citizens for Honest and Open Government have given selflessly of their time to bring valuable information to the public, and deserve a little recognition . . . The information is more comprehensive and accessible than the official government websites that you, the taxpayer, have paid for. It just goes to prove that individuals can . . . and will . . . make a difference! 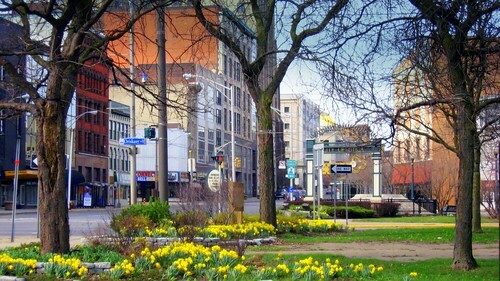 Ahh Spring . . . .
Spring comes to Downtown Utica . . .
MV Calendar . . . Looking for something to do? Check out Rob Thrasher's Mohawk Valley Calendar ! There seems to be something going on in the Greater Utica - Mohawk Valley region almost every day . . . I have added Rob's calendar to my "Blogroll" with this button - - to keep it handy. Not the Usual Hinckley Outrage . . .
Hinckley is in the news again -- in the Sentinel -- in a story about how safe are Delta and Hinckley Dams. The satisfactory rating for Delta comes from an inspection conducted by the state Department of Environmental Conservation. Delta Dam impounds the Mohawk River at the palisades, about four miles north of downtown Rome . . . 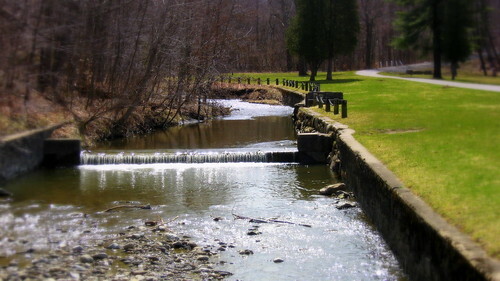 The satisfactory rating for Hinckley, about 20 miles upstream from the Village of Herkimer, is based on assurances from the federal government. Even though the dam astride the West Canada Creek on the Oneida-Herkimer county line is owned by New York, state DEC inspectors were turned away when they showed up for a no-notice check on June 19, 2006. Blocking their access were guards for the New York State Power Authority, which operates electricity-generating stations downstream. New York State cannot inspect its own dam because the Feds say no? Read the story of how the DEC inspectors (who we pay to keep us safe) were given the runaround, and the response from the Federal authorities that was basically "trust us." Sorry, trust must be earned. Pursuant to Federal policies: (1) our industrial capacity has been exported offshore, (2) American companies and assets (including utilities and highways) are subject to foreign control, and (3) we are overrun with illegal aliens. It would seem no big deal for an enemy to collapse our financial markets and infrastructure, and take over -- from within. NO, I do not feel safe. . . . and these are areas that are federal responsibility. This is serious stuff folks . . . The Federal government can shove a power line in your back yard, make you spend millions on drinking water regulations to address issues that have never been a local problem, control what goes on in your classrooms -- but not do the things that only the Federal government can do to keep us safe. What ever happened to the concept of a federal government with powers limited to those given in the Constitution, with all other powers reserved to the States and to the People? We are well overdue for dusting off the concept of state's rights. As I indicated a few days ago, promotion by a chamber of commerce is important to a community's well-being. In this day of the Internet, "Web-presence" is a significant factor in promotion. How are our Utica-Rome area chambers doing on the Web? Take a look at their sites. I think you will agree that the sites reflect their host communities' outlook. One affects the other. I've arranged them (in my amateur judgment), from worst to best. The number 1 loser is the Utica area chamber. It now calls itself the Mohawk Valley Chamber of Commerce and "Utica" is literally lost on its website. While the site shows some professional design work, the photo show is limited to 4 pictures: of the Stanley Stage, the Boilermaker, Ft. Stanwix, and Herkimer Diamond Mines. The first two are not identified as being in Utica, and the latter two are not even in the Greater Utica area but are in areas having their own chambers. If you click on the link for a description of "our area," you are taken to a "pdf" document that takes time to load, and is almost all advertisements. If the reader takes time and scrolls through several full page ads without clicking off, he/she is given a very generic description of the area (with no place names) and some dry population statistics among more ads. 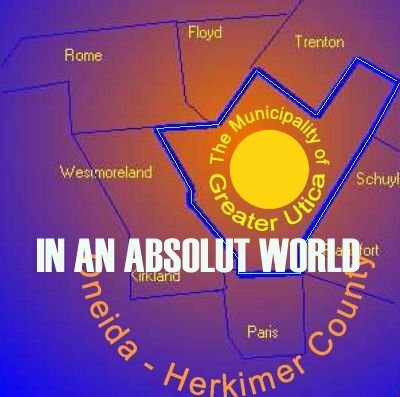 Then following more full page ads one gets to a map of Madison, Oneida, and Herkimer Counties (nice map, but wrong focus) and then (finally) some history and more statistics. Illustrative of the problem with this document (and this chamber), a population curiously is given for "Rome/Utica" combined. If you've gotten that far, only then do you get some decent information about what the area has to offer, but not necessarily the Utica area. The little of Utica that is described is buried in "regional" static. There is a lot more to showcase in the City of Utica than the Boilermaker and the Stanley: the Utica Symphony, M.V. Ballet, O.C. Historical Society, the Utica Zoo, M-W-P Arts Institute, Children's Museum, and the Brewery. It has interesting places such as Varick Street, Bank Place, Bleecker Street and "Uptown." For higher education it has Utica College, MVCC (with its Edward Durrel Stone-designed buildings), and Pratt at MWP -- all within its compact 16 square miles, and SUNYIT just beyond. Utica has a rich history, interesting architecture (such as Union Station and the M-W-P Art Museum by Philip Johnson) and interesting street layout. It has one of the most extensive municipal park systems in the state, including the Olmstead-designed Parkway. 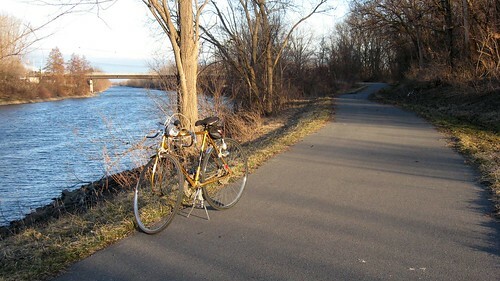 You can bike on the Canalway Trail, ski and sled at Val Bialis, golf and cross-country ski at Valley View, hike and birdwatch at Utica Marsh, and play tennis for free at several locations. Utica has one of the most diverse populations in the country, and, undoubtedly, some of the best restaurants and pastry shops this side of New York City. (It even has its own food: chicken riggies, tomato pie, half-moons, and Utica Club!). It also hosts some great events such as Utica Monday Nite, the M-W-P Summer Arts Festival, the St. Patrick Day Parade , and a host of church/ethnically oriented festivals. 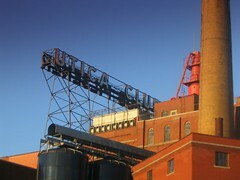 There is simply no reason not to promote all that Utica has to offer, both in pictures and words. The MV C of C website fails. It needs to put Utica back in its name -- and back in its focus. Loser number 2 is the New Hartford Chamber site. At least it wears its community's name . . . but that is about it . . . It seems almost self-absorbed (reflecting the attitudes of community leaders, perhaps?) focusing on its own (chamber) activities. There is no listing of members or what types of businesses they do (hence nothing of value to members is provided). There is no community history, no description of NH's great school system, no pictures of the village or landmarks. There are some links to other local websites. In short, the NH C of C website does little to promote New Hartford or entice people to go there. . . . How ridiculous! 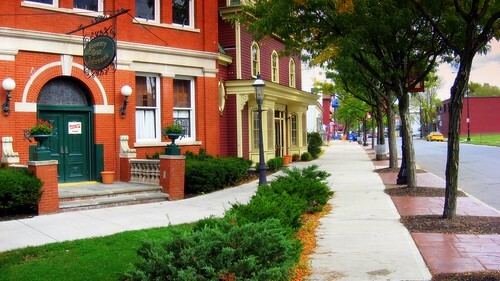 The Village of New Hartford is pretty, and shopping at the NH Shopping Center, Sangertown and on Commercial Drive is the best in the western Mohawk Valley region. How about some pictures promoting these? The Marcy Chamber site comes in as loser number 3. The site welcomes you, and invites you to visit Betsy the Barge this summer. It makes it easy to find merchants who handle particular goods or services (so members of the chamber are getting exposure for their membership). There also are pages recounting local history. Some external links are provided. But that is about it. No pictures . . . . nothing about the school system . . . nothing about the neighborhoods . . . nothing about the stable property taxes (which is a real plus). It links to a "Call Mohawk Valley Home" website that does not exist. There is little here to make you want to stay and explore (either virtually or in person). Some pictures of Lock 20, the Marina area and maybe some people fishing along the canal might help draw people in. The Rome Chamber site is a winner! It does a nice job welcoming you, promoting upcoming events, and offering a "virtual tour" of Rome. With the expected emphasis on Rome, it describes the advantages of living in the Utica-Rome area, the educational and medical institutions near by, and all of the region's attractions. There is also an extensive member directory. The Rome site showcases Rome to its best advantage, but also shows that Rome is part of a larger region which is a fantastic place to live. About the only thing I would add are more pictures than the few there. Lake Delta, Erie Canal Village, Ft. Rickey and Fort Stanwix should provide some great photo-ops. The Clinton Chamber site wins a "Gold Star." It is the most visually appealing of the sites visited with graphics that are "clearly Clinton." It gives a nice description of the community (with pictures), its location, and local attractions both within Clinton and nearby; describes its history; and provides an extensive member directory. It also seamlessly ties into "villageofclinton.com," which appears to be a private effort of particular businesses, but is also visually appealing, supplies a map, and presents a "flash" photo album of the village. The combination Chamber-private effort makes you want to linger and explore the sites . . . and visit Clinton! Looking at these websites, it should come as no surprise that Clinton and Rome are doing relatively well compared to the rest of the region. Their business leaders actively promote what these places have to offer. Whitestown, Whitesboro, Oriskany, New York Mills, and Yorkville don't have a C of C of their own, but each has something to contribute and is a vital part of the Greater Utica area. "Loser" organizations 1, 2 and 3 above don't seem to offer their areas much, perhaps reflecting the dysfunctional relationships among Greater Utica's parts. Perhaps if the businesses in these and the "loser" areas came together under a Greater Utica Chamber, they would do a better job promoting themselves, and Greater Utica -- and join with the "winners" in Rome and Clinton and other area chambers under the Chamber Alliance to promote the Upper Mohawk Valley region. Who should run SUNYIT? That's the question being considered right now as the search continues for a new college president. The race seems to be coming down to four names [which I have linked to the results of Google searches]: Dr. Jerry W. Samples, Dr. Charles R. Westgate, Sr., Dr. Matthew C. Cordaro, and Dr. Bjong Wolf Yeigh. Why am I excited over who may become SUNYIT president? A dynamic academic leader can do wonders for the economy of a community (e.g. Dr. Alain Kaloyeros, VP and Chief Admin. Officer of the College of Nanoscale Science and Engineering at U. Albany, who was the moving force in making the Capital District the nano-research center it has become). If you click on the links above, one candidate seems to stand out: Dr. Cordaro, who is the Director of the Center for Management Analysis at L.I. 's C.W. Post College. He not only has management experience in academia, he has extensive private sector experience as well . . . in the field of power generation. With the NYRI powerline looming and the high cost of power dragging on our economy, power is a make-or-break issue for us. With the strategic center of the State's power grid sitting literally footsteps from the SUNYIT campus door, having a gentleman with Dr. Cordaro's credentials as an area resident might open opportunities for synergies, and make the facilities here work to our advantage. An op-ed piece he did for the Times last year certainly seems consistent with Greater Utica's interests, and not only shows a willingness to take issues to the people, but an ability to make them understandable. He also does not seem to be afraid to mix-it-up with the people in charge. It will be interesting to see if he is selected. Assemblywoman RoAnn Destito, D-Rome, and Sen. Joseph Griffo, R-Rome, will make the announcement at 10 a.m. in the Mele Room of the Peter J. Cayan Library, according to news releases. The announcement is about funding for initiatives at the college, but SUNYIT interim President Peter Spina said he did not know the specific programs to which it was referring. WOW -- Mr. Griffo and Ms. Destito know what is going on, but the college president does not. What's wrong with this picture? [11PM Update: SUNYIT will be getting $50 Million! Nice work! Loot for Luther Forest . . . The new state budget is passed, and another $46 million is being spent on site improvements in Luther Forest near Saratoga, to prepare it for the AMD chip manufacturing plant. At this point in time it's full bore ahead ... with the expectation that sometime around next January they'll be able to start construction," said Malta Town Supervisor Paul Sausville. About $32 million in bids for a 5 1/2-mile road project for the industrial park were let this week, while the county is building a water system that will also serve the site and a sewage treatment plant is being upgraded, he said. "We have not yet committed to the plan. We have until July 2009 to commit." All this spending for a particular company - one in financial trouble - with no commitment? Hardly comforting words. One has to wonder, is this spending of state taxpayer money really about creating sustainable jobs . . . or is it a way for well connected contractors to get rich? 50,000 hits since February, 2006! Almost 100 Bucks . . . for every man, woman and child in Oneida County. That's how much the County has borrowed for the new Oneida County Airport at the former Griffiss Air Base. That's a lot of money for a facility that practically none of the men, women and children in Oneida County ever see because Oneida County has not had scheduled air service since 2002. That's a lot of money for a county which has one of the highest sales taxes in the nation, some of the highest property taxes in the nation, some of the highest utility rates in the nation . . . . but where incomes are among the lowest in the nation. Twelve million dollars of the total $22 million were borrowed just this year ... That's a lot of money to borrow with little advanced notice to the public and legislators . . . and little media coverage (at least so in Greater Utica) . . . . but also apparently with little debate considering the county legislators' "rubber-stamp" approval given in February. Neither does spending money that you cannot afford to spend. Spare the rhetoric, Mr. Picente. Our tax rates, caused by big spending, are driving jobs away. While we are happy to have Empire Aero, the cost seems hardly worth it. We've already spent $25,000 per job created to date ($10,000,000 already spent divided by 400 jobs) and will wind up spending $27,500 per job if everything goes WELL and we have 800 jobs after spending $22 million. Of course, these amounts do not include millions more in financing charges, nor the millions the County is doling out in other forms of support (such as on site MVCC training). We have lost a lot more. The Old Oneida County Airport in Whitestown was a gem, was well taken care of, and was perfectly sized for the Utica-Rome market. Private pilots loved it. When it had scheduled air service to places that people wanted to go, the people who flew out of there loved it. (Where else could you park FREE and literally walk less than 200 yards to your plane?) The place only needed some better marketing -- but with the incompetents/lazy people in charge of Oneida County for the last 30 years, it should come as no surprise that smaller places like Elmira continue to have regular air service while Utica-Rome does not. Inexcusable! Given the quality of our leaders, it is no surprise that we abandoned our gem and are now stuck with a facility that is far too big for our population to justify or afford. The only question now is, how long are people willing to take more of the same? 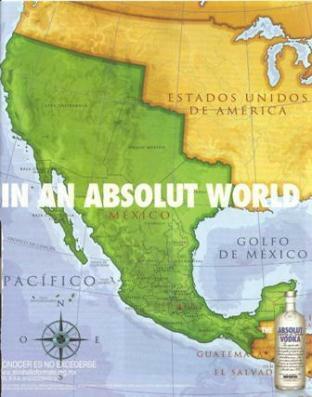 In An Absolut World . . .
Absolut Vodka got a rise out of Michelle Malkin and World Net Daily yesterday with the ad at left. Me? . . . . . . I rather like the ad below . . . It's shocking how much money is being spent in Oneida County on the Utica + New Hartford + County call centers: $2.6 million according to the Observer-Dispatch -- mostly salaries. . . . It's costing about $12.50/person in Utica, $25/person in New Hartford, and $9.33/person in the County. (The economy of scale should be obvious from these napkin-back calculations). However, local businesses such as APAC have been performing similar services for people all over the country, building up expertise in handling calls and becoming efficient enough to compete with call centers in other countries. It's answering the phone and networking with the right service providers, folks . . . not rocket science. Why aren't we drawing on our very own local expertise to cut down costs and improve services? Maybe its time to privatize our 911 services. A couple more education stories got my attention this week. The residents of Waycross, GA got the shock of their life to discover that a group of their third graders had devised an elaborate plan to kill their teacher. The plot by as many as nine boys and girls was a serious threat, Waycross Police Chief Tony Tanner said Tuesday. The students allegedly brought to school a broken steak knife, a roll of duct tape, handcuffs, ribbon and a crystal paperweight in a bid to kill their teacher, Belle Carter, the paper reports. . . .
Tanner said the scheme involved a division of roles. One child's job was to cover windows so no one could see outside, he said. Another was supposed to clean up after the attack. With the de-emphasis of substantive knowledge, and paramount importance given in today's classrooms to students "learning" to work together in groups, have these kids learned their lessons well, or what??? More traditional lesson-learning is revealed in the story of a 5th grader from Michigan. It seems that Kevin Stufflebeam was touring the Smithsonian in the Nation's Capital and noticed on a 27 year old exhibit that the "Precambrian" was erroneously called an "era" rather than a dimensionless period of time extending from the beginning of the earth to the beginning of the Cambrian period. (For more on Geologic Time see this from U Berkeley.) He notified the museum which admitted its mistake. His teacher must be proud! Which kind of lesson do you want your kids to learn? Out of Control in Whitesboro . . .
First it was Utica's school district proposing to hire a public relations outfit to "handle" Utica's proposed capital project. No, no, no, we cannot say "sell" the capital project because it would be against NYS Education Department rulings to use public funds to advocate for a particular vote on a project. Now the Whitesboro school district is getting into the act. Anyone who believes that the "campaign's purpose isn't to sway voters in favor of the capital project" is a fool. The Superintendent had to say that to make what is being done sound Kosher. The County has already hired a PR firm to "handle" its sewer fiasco, and it is this blogger's understanding that the Water Authority is following suit on some of its issues. One has to ask, if government has to hire public relations firms to "explain" things, then "What is it selling?"